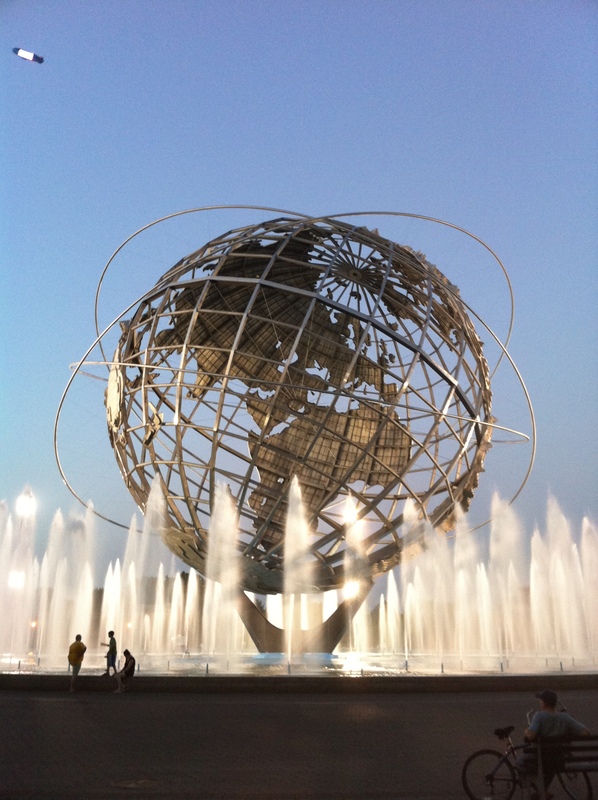 I’ve driven past, flown over, and attended baseball games next to the Unisphere but have never really took much time to study it. This evening my good buddy John Strang and I went out to Flushing Meadows to see if we could find some cheap tickets to the U.S. Open – we couldn’t so we decided to go explore some of the fair grounds. First off – until you get up next to it, it’s hard to see just how big it is. Second – it’s got texture to it, like a topographical map. You can’t really see the topographical feature from this shot because we’re looking at the vastness of the Pacific Ocean, but you can see how large it is. It’s something like 140 feet tall and 120 feet wide. It dwarfs the people sitting at the base of the fountain and really they’re sitting a good 50+ yards away from the globe. 700,000 pounds of stainless steel… pretty amazing stuff. P.S. – yes that is a blimp in the top left corner… Nadal was playing on center court. ~ by chj48 on August 31, 2010.